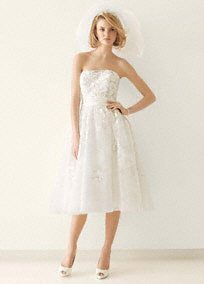 Exciting news for every second time because David’s Bridal has its Spring 2014 collection and there are some gems to choose from. 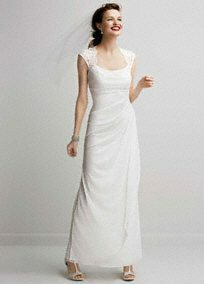 The selection is vast, you can find second marriage wedding dresses, bridesmaid dresses and accessories. We love what they’ve put together for ! We are spotting a lot of new trends from softer silhouettes and fabrics to new iterations of pastels in bridal looks. 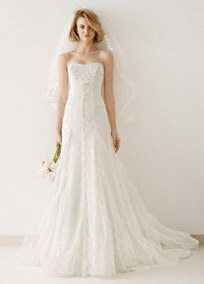 Wedding dresses for second marriages are also easily found, there is a gorgeous collection full of different shades of soft pastels and pastel accents in flowing and delicate fabrics, a trend we’re definitely seeing in 2014. These softer silhouettes and colored bridal gowns in Champagne, Blush, and Whisper Pink pair well with almost any skin tone and create an airy, ethereal feel. David’s Bridal has partnered with designers like Melissa Sweet, White by Vera Wang, and Oleg Cassini to create a collection of affordable designer dresses that keep up with the latest fashions. And they just launched Zac Posen’s first bridal collection, Truly Zac Posen, and we’re obsessing over these designers this Spring. 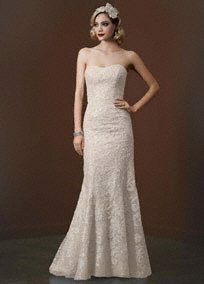 Don’t just think this is for a first time wedding, as all of these new designs would look amazing a second marriage wedding dress for a bride looking for a classically designed gown. We simply adore all of the new designs, and we love even more that the new collection is on point with spring bridal trends! This brilliant soft Chantilly gown is the definition of effortless beauty! The soft elegant silhouette creates a stunning ethereal look. This gracefully designed petal-detailed dress combines femininity and sophistication for a true one-of-kind creation! Strapless bodice features signature designed petal-detail bodice. Fitted waist defined by curved seaming creates a stunning and flawless silhouette. Feminine and elegant, this strapless sweetheart trumpet gown is classically beautiful. Beaded lace on the shirred tulle bodice accentuates a flattering shape while the sweep train adds just the right amount of glamour. Say I Do on your special day, in this beautifully crafted wedding dress! Sleeveless bodice with sweetheart illusion neckline is adorned with chunky stone detail for added glam. Polished and refine this strapless sequin wedding dress is the definition of effortless beauty! Strapless bodice features all over sequin fabric with unique and opulent metallic gold lace appliques. You will look breathtaking in the timeless and chic wedding dress! Empire bodice features ultra-feminine lace cap sleeves and eye-catching open back detail. Long and soft with intricate beaded lace details gives this wedding dress a sweet romantic appeal! Soft a line silhouette veiled in tulle features ultra-feminine sweetheart neckline. Envision Hollywood glamour as you walk down the aisle in this chic tea length wedding dress! Strapless tea length organza gown with gorgeous lace appliques features diagonal banding on skirt. Fun for a laid back second wedding, this satin draped one shoulder short gown with pearl embellishment at side drape.